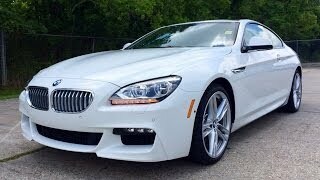 BMW released its 6 Series in three different models, namely; two-door Coupe, Gran Coupe with four doors and Convertible. Each of these gets one or the other option for its buyers to make their ride a joyous experience. Here we’ll be talking about the recent release BMW 6-Series Convertible2015. After making a complimenting entry last year with Convertible 2014, BMW updated the previous version in many ways and thus for the buyer's presented this all new 6-Series Convertible 2015. 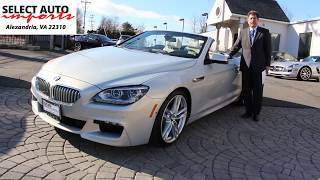 Let us have a closer look to find out the upgrades in looks and features received by this all new revised model from the house of BMW 6-Series Convertible 2015. The interior of BMW 6 Series Convertible 2015 brings a lot from its ancestor however for this model center console gets adored with a high-gloss black surface with the iDrive display getting a chrome surround. The enlightening touch spreads with the LED-illumination over footwells and door exists. The major change for this BMW 6 Series Convertible is the color options it brings for interior; range includes Ivory White and Cognac spreading dual tone with Black. Each color trim gets accompanies by fineline brown wood trim around the interior. In major the interior comes with an option of two packages for the buyer's; Design Pure Excellence and Design Pure Experience. For both these packages, leather upholstery, contrasting stitching and interior colors differ. Just like the interior changes in the exterior of BMW 6 Series Convertible 2015 isn’t much but a close inspection through an eagle’s eye will bring a few into your notice. Our search operation brought us some like the reshaped grille which held 10 vertical bars previously now comes with nine. Apron now comes with single air intake piece incorporated in it and yes the LED fog lamps get a chrome surround making front fascia beautiful. Front end works doesn’t ends with just looks; it also gets LED headlamps as standard incorporation for all its models; however High Beam Assistant and Adaptive LED technology get in the list of options. On Side mirrors you’ll notice integrated indicators in shape of slim light strips. The aggression is gained by BMW 6 Series Convertible through its multi spoke 20” wheels. Moving towards the rear fascia, larger exhausts and chrome strip in bumper line is major one to notice. Just like the interior exterior too carries the same Design Pure Experience and Design Pure Excellence packages offering more upgrades in looks through, grille reshape, trims, wheels etc. Just like last year’s engine variants, BMW 6 series Convertible 2015 comes with same two variants in different version models. The first one in list is 640i powered through a 3.0 Liter inline six cylinder producing 315 hp and 450 nm torque paired to eight Speed Steptronic transmission with gearshift paddles mounted behind the steering wheel and launch control. This version of BMW 6 Series Convertible reaches the top speed of 155 mph (a hike of 20 mph in comparison to last year) while the 0-60 mph comes in 5.4 seconds. The second version of BMW 6 Series Convertible 2015 is 650i powered by a 4.4 Liter V8 engine producing 445 hp and 650 nm torque and is also mated to eight Speed Steptronic transmission with paddles mounted on same location. The model is capable of finishing 0-60 mph sprint in 4.5 seconds while top speed remains same.